So after a few years of not really touching this, I figured I'd take a look back at it again and make some changes to what my mod previously was. Below is most of my original post from the old topic, but with additions based on the ver. 2.0 changes. If something listed in the original post was changed, it now is italicised and the remade gameplay is listed afterward. Domingo and Jogurt are left out because they are, in my opinion, truly "secret" characters. Hanzou and Musashi are left out because they come promoted, and that really messes with EXP early game. Elemental spells (blast, blaze, freeze, bolt) all have the same cast range and AOE progression, the only variations being damage and mana cost. Bolt has had its mana cost SIGNIFICANTLY reduced (4,8,12)to make it more balanced. Blast: Scaling AOE damage, but requires you to be right next to the enemy to cast. Blaze: Medium-sized AOE at short range. Freeze: High single-target damage at increasing range. Bolt: Medium-large sized AOE damage at massive range. Summoning spells have been added! Characters learn summon spells in series of two; level 2 and 4 are single target with high damage. levels 1 and 3 are AOE but deal 1/3 of the damage of the full force level. I did this to compensate for SFI not having a "damage distribution" system that other summon spells use. Summon spells now are 4 level single target spells with a pattern similar to freeze, starting as a low range damager and growing into a massive 10 range nuke of mass destruction, but having a significant mana cost attributed to them. Healing spells have been buffed slightly; heal has had its range increased at all levels to 2/3/4/4 and mana cost rescaled to 3/6/9/12, with each level healing for 15/30/45/60 (heal 2 is no longer just a range increase). Aura retains the same cast range and AOE as Vanilla, but has rebalanced mana costs of 4/12/18/24 level and has had its healing reduced to 10/20/30/40. Status spells (boost, attack, detox, shield, etc.) have all received more levels, with each buffing spell reaching party range at level 4, and debuffing spells reaching bolt 2/3 range at level 4. Amon and Balbaroy have been outfitted with bows and fire arrows from afar! Both have received a bit of attack power at the cost of defences, so keep them safe! The Hero class has been renamed and features a... transformation for Max. I don't want to spoil it before you promote Max yourself, so I won't say here and NO PEEKING AT THE ROM. Jogurt can now gain levels! He gains stats fast, and hits hard if you feel like grinding him. Guntz and Kokichi can no longer use ranged weapons. They stick to being in the fray, and have received defense boosts to allow them to fight it out. Guntz should still end up as a massive wall, but won't hit back hard. Adam has received large boosts to his stats, and should end up as a heavy hitting tank. Early game, he won't be able to hit hard, but will soak up attacks very well. Once he is promoted, his attacks become ranged and his attack begins to grow. Bleu has been hit hard early game. He has late growth on both his attack and defense, so be careful early. He should still be a powerhouse late game, if he survives that long. Gort and Luke are rather similar: strong front liners. Luke grows a bit more defensive and Gort shifts to his offense, but they are not very different in the end. The mages are more defined by their spells. Tao learns cheap blaze magic fast and gains a fire-based summon, does not have the most mana, but has balanced stats all around. Anri gains Freeze magic more slowly and an ice-based summon and gains a lot of defense, but not much attack. She has more mana than Tao, but when it runs out she won't do much. Alef is all about offense. She gains powerful bolt magic, a lightning-based summon, the largest mana pool of all the mages, and fairly decent attack, but is quite frail and will fall fast is she is out of position. The spell changes for ver. 2.0 were made to diversify the mages. Tao should be a bit more like her vanilla self, scorching a small cluster of enemies; Anri now gains an ever-increasing range, allowing her to freeze targets instantly from far away; Alef has become the force's artillery, capable of blasting large groups of enemies from far away. Lowe, Khris, and Torasu have their own specialties. Lowe will gain a large mana pool fast to sustain his team with Heal, but he does not learn aura to heal more than one person at a time. Torasu will have a small mana pool early, but he gains aura before any other healer and gains the most mana late. Khris focuses less on healing and more on offense. She gains heal and aura, but only up to level 3. In return, she has blast magic and a fairy summon, as well as a decent attack. she does, however, have a small mana pool, so siphon her spells wisely. Gong is more fighter than healer, coming with a tiny mana pool but high attack and defense. He has buffing spells to support himself and his team, but don't rely on him to save anyone in a pinch. Diane, Hans, and Lyle have different strengths and weaknesses. Hans has the lowest attack, but the highest crit chance. Diane has a bit more attack, but less crit. Lyle has the highest attack, but the lowest crit. Diane and hans are swift and frail, while Lyle is slower but able to take a hit. Zylo is designed to be a swift killing machine. He has high attack and agility early, but is quite frail. Use him to assassinate targets that stray from their comrades. Not much has changed with items. Rings will look dull when they are about to break and give 1 less stat point, the Sugoi Mizugi and Kitui Fuku are now equippable armor for mages and give different stats, and the chrome lance is now the chrome spear, giving knights a ranged attack before the valkyrie. The biggest changes are in the extended items, with a new staff for vicars, a new halberd for knights, and three new charms for the mages (I am currently working on making them give special outfits to each mage, but I have not finished yet. Increased Mae's base attack, attack growth, and changed her attack growth type to help her out early. Increased most early game enemies' levels to give more xp to help with levelling. Nerfed Ghouls' attack, defense,and evasion. Buffed Silver Knights' attack and HP. Buffed Hellhounds' attack, defense, agility, and HP. Removed several bosses HP regeneration. Their battles have been reworked so that their "little helpers" (AKA ) now have healing spells rather than shield to allow them to have sustain (if they stay in one spot) and allow your mages to damage them. Rings no longer lose stats when they crack. Reworked chapter 1 world map slightly to remove some pointless roads, add some trees, and add more land to walk on. Adjusted Shade Abbey so that balbaroy isn't saving himself. Adjusted Quarry battle to make the Dark Elves not respawn. Widened choke points in the Balbazak battle. Added a new lance to drop in the Ramladu fight. Sugoi Mizugi and Kitui Fuku no longer change Tao and Anri's map sprites. New mage weapon for each mage that changes their map sprite. Adjusted some battle backgrounds to their SFCD backgrounds because they are a bit cleaner. Adjusted AI to prioritize healers over Max. Please, please, please let me know if you come across any bugs. Have fun! V. 2.2: Rebuilt the Ai that had broken in the Kane battle and rebalanced spells. In brief, Blast has had its mana cost increased and damage changed to scale with level, Blaze has had its mana cost and damage increased, Freeze has had its damage increased, Bolt has had its mana costs at level 2 and 3 reduced and damage increased, Aura has had its mana cost adjusted and healing reduced, and all summons have had their mana cost and damage increased. A .txt file is attached with all relevant spell data. V. 2.3: Updated Item use ranges that had not been updated when spells were. V. 2.4: Patch made on an unexpanded vanilla rom to hopefully fix issues with spells. Hidden Items in Chapter 7 all moved to the Tower battle. Last edited by ShininGeek on Fri Jul 22 2016 7:50pm, edited 13 times in total. Will you be uploading this to the steam workshop I'd love to check this out without having to mess with a rom. I wasn't aware the Steam workshop was a thing for Shining Force. I'll check it out. Edit: Thank you summer sales. Got SFI and SFII for 75% off. I'm not sure how modding these will work, but I'll try. Edit 2: Oooooh, this is fancy. I'll try and make it presentable, then upload it. Edit 3: The mod is now on the Steam Workshop! Let me know if there are any issues! Last edited by ShininGeek on Tue Jun 28 2016 7:22pm, edited 1 time in total. I'll go test it out from the steam workshop! E: Do note if you intend to use the rom from steam, I've heard you need to use the regular thign that has the living room in it, instead of the simple launcher. E2: One small issue when going to the first battle: The caravan follows what I believe to be the old path, rather than the new one, a really minor detail, which might be a bit difficult to fix, and I understand you might not do it. Yeah, I cant really change that, I don't think. Mostly because I can't change the walkability of the map until the second battle has started, so if you ever egress from the first battle, go over the waterfall. And how can i find it on Steam Workshop ? Oh, didn't expect to see this. Looks like it's time to pick up SF again for awhile. Been ages since i played SF, i may give this one a go but cannot remember how to play it using the Emulator lol. Is it just, place the rom in the folder and load it up from the Emulator? Edit: Oh is an IPS file, what to do from here? You need to apply the ips patch to an unmodified rom using an ips patcher. If you don't have a patcher, just google it and you should be able to find one to use. Just did but it says the file is invalid once i have patched it. That's interesting, the whole team joins at the very beginning lol Apart from the ones which you mentioned. Eh how comes I can't use any Medical Herbs during battle? You shouldn't have any issues using medical herbs, I never messed with them. They still have the proper use range and effect. Odd, I haven't had any such issues. Did you patch a clean rom, or a modded one? I'll try and make a new patch to see if I can fix those issues, but I'm not sure why they are happening. Edit: ok, I recreated the patch and uploaded it. Try and apply it to a clean 4MB rom. Been having a good time playing though your hack again, noticing some AI weirdness around Kane though. I figure those four enemies are supposed to move somewhere when I get close, probably to one of the houses, but they are just standing around. Don't know if that's intentional, but it's gonna take like three hours to get through these guys to Kane. I'll take a look at it and see why they might not be moving. Edit 2: I rebuilt their Ai. They should move to the far house now. Also, I rebalanced spells to have mana costs based on their AOE and damage. A .txt file with spell data and the patch for V.2.2 are in the main post. Works just fine now. Kane is down, that fight took a long time with the boost/attack mages. And Kane killed half of my party, of course. 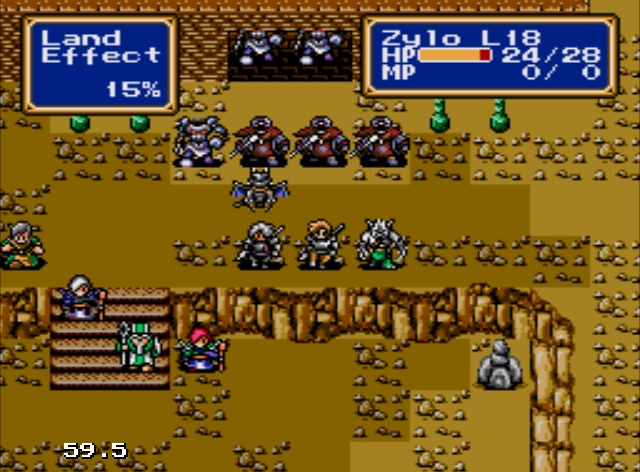 It is actually pretty fun when a boss matches up against your whole party. Oh, Lyle has too many spells I think, he just learned two and at some point picked up three more that I didn't notice. v He's making my actual casters jealous with all of his spells right now... attack, muddle, slow, drain, and zeus. Haven't even seen those last two before this. Last edited by Sniper Lyle on Tue Jul 19 2016 4:40pm, edited 1 time in total. In the Kane battle, you should be left with the choice of either going and killing the bishops in the far house (they have no offence whatsoever, so they shouldn't be a challenge, just might take some time), or going to fight Kane while he has the buffs they give. So in the final battle of chapter 7, near the bottom right corner of the map there is a little house which seems like it would indicate an area to enter, but moving Max to that square does nothing. Is there actually something there or is it just decoration? That spot has a secret item. You can only get it during the final battle of chapter 7. There were two other items similar to it hidden in chapter 7. Oh, I think I know what it was then... But when I went to that spot during the battle I wasn't able to search it. I noticed the rom got corrupted somehow, and that's why a bunch of characters had weird spells. Repatching to a clean rom fixed everything, but I think I lost out on a couple things. Apparently Max was supposed to learn Bolt?